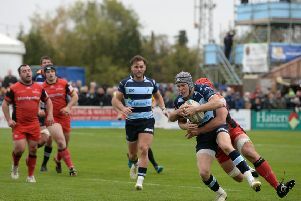 Bedford Blues suffered an agonising 25-18 defeat to Jersey on Saturday afternoon as they threw away a 12-0 half-time lead. Tries from Paul Tupai and Tom Griffiths put the Blues in control, but the second half belonged to the visitors. They edged in front through a Mark Cooke try and penalties from Brendan Cope, before Jersey put the game to bed with a last minute converted try. Bedford found themselves down to 13 men at one stage in the first half due to both Tupai and Justin Blanchet picking up yellow cards, with Blanchet later receiving red for consistent offences. The Blues certainly started the better of the both sides as they looked to turn on the attacking pressure straight from kick-off. Myles Dorrian found Michael Le Bourgeois in acres of space down the right wing, before sending a chip in to the space but the ball fizzled away before going in to touch. Bedford finally took the lead in the 11th minute after dominating possession in attack. Myles Dorrian sent a penalty to touch before an excellent piece of play from the forwards sent Tupai crashing over from the driving maul. Dorrian sent the conversion just wide. The first half saw another impressive performance from the Blues as they looked to exploit the Jersey defence time and time again, but the visitors manager to keep the scoring down. Jersey went in search of a try of their own down the other end as they to set up a driving maul just in front of the Bedford line which was brought down by Blanchet who was shown yellow. The resulting penalty was sent to touch but the line-out was over thrown and Bedford cleared their lines. Despite being a man down, Bedford went in search of a second try. Dorrian broke with the ball inside his own half before Pete White swooped in and sent a grubber through to Griffiths who went flying over. Dorrian sent the conversion over the uprights. Bedford looked to switch off shortly after the restart as Jersey applied pressure on the Blues defence with a driving maul. Jersey edged closer to the line before Tupai was shown yellow for collapsing the maul – leaving Bedford down to 13 men. The following penalty was sent to touch, followed by the sound of the half-time whistle. Jersey took advantage of their numerical advantage almost immediately after the restart. Another key battle between the forwards went the way of the visitors, before Thomas Howe dotted down – allowing Brendan Cope to slot the ball between the uprights to bring the score to 12-7. Bedford battled on, looking to extend their lead, and they were awarded a penalty which Dorrian struck just wide. Minutes afterwards, Cope had the opportunity to send a penalty over the posts and he made no mistake to reduce the Bedford lead to 12-10. The Blues carried on in search of that all-important try, but the Jersey defence absorbed the pressure until an impressive drop-goal from Dorrian took the Bedford lead back out to five points. Jersey were starting to pin the Blues back, and the pressure finally told as Sami Filsilau went crashing over on the hour mark – giving Cope a straightforward conversion to take the visitors in to the lead for the first time. Bedford responded by putting pressure on the Jersey 22, resulting in a lineout where several opposing players were deemed offside, allowing Dorrian to send the penalty over the posts to give the Blues an 18-17 lead. The Blues suffered another setback in the final stages of the game as Blanchet was shown a second yellow card for a late tackle on a Jersey player, and from then on Bedford were fighting an uphill battle. The hosts were defending exceptionally well, but referee Matt O’Grady penalised the Blues at the scrum and Cope sent the penalty over to give Jersey a slender lead. The last five minutes saw Bedford dominate the attacking possession as they looked to break away for the try, but Richard Lane swooped in and intercepted a pass just inside his own half before charging towards the line to seal the victory. Cope added the extras as the full-time whistle sounded. Bedford Blues: O’Conor, Tapley, Le Bourgeois (Jones 71), Griffiths, S Blanchet (Staff 61), Dorrian, White (Burns 56), Parilli-Ocampo (Currie 50), Clare (James 60), Alo (Thompson-Stringer 50), Tupai, Wells, J Blanchet, Buggea (Conlon 56), Fenton-Wells (c). Jersey: Adair, Howe, Evans, Cooke, Lane, Cope (Owen 80+3), Fisilau (Winter-Moates 61), Lockwood (McCarthy 66), Garcia-Veiga, Kerrod (Herriott 55), Campbell, Kolo’ofai (Markham 72), Rae (c), Freeman, Haining (Spinks 71).